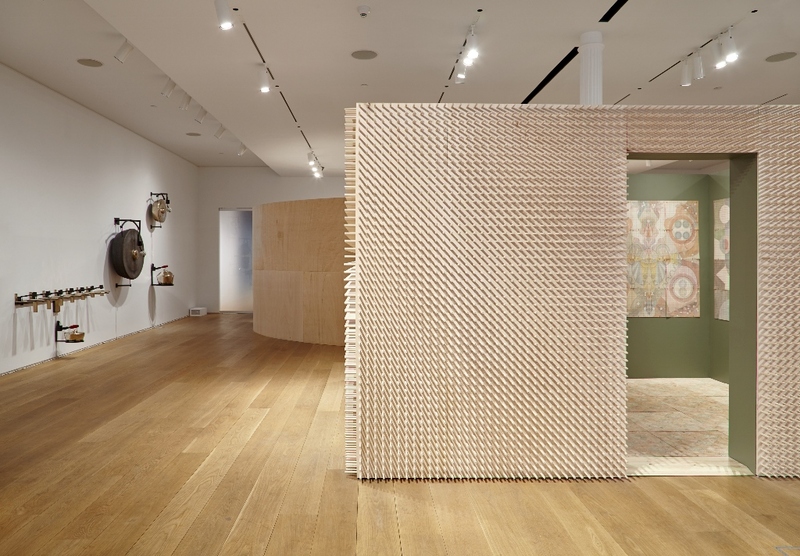 Interview with Louise Despont: Part II | The Bottom Line "The Drawing Center"
Louise Despont: Energy Scaffolds and Information Architecture will be on view at The Drawing Center until March 20. More information about the exhibition is available here. BL: How has your time in Bali changed you as a person? And how has that affected the work that you have made for The Drawing Center? LD: There are so many aspects of Bali that have had a powerful influence on me, and it is no exaggeration to say that I have been transformed by my time here. I grew up in New York City and have spent most of my life in big cities. In Bali, I really discovered how much I love village life. Its scale and speed feels like a huge relief for me. I have been living in a house that is only reachable by a small path that is just wide enough for a motorbike. The path turns into a tiny dirt footpath that leads through rice fields. Being in a remote area and disconnected from a road has been essential for the drawings in this exhibition. [….] When I walk home at night, the moon is the only light source. I walk through the rice fields using my cell phone as flashlight, stepping over frogs and hoping not to see the occasional snake. Experiencing this deep silence stirs up an interesting fear, one that I have come to appreciate: the fear of being in the dark, of being alone, the fear of both the silence and the sounds heard in the night. These intuitive fears are almost childlike, yet they are still so powerful. Walking home at night is like entering the studio or beginning a new drawing, because I am confronted with a silence that could be either terrifying or a space of real clarity and insight, depending on my relationship to fear. The Hindu culture of Bali is also totally singular, and their extensive practice of daily offerings and ceremonies has the effect of creating an energy that is unlike any other place I’ve ever experienced. The constant stream of daily offerings makes you aware of a reality that is larger than yourself and creates a space that is very much alive with communication. I feel so grateful to the Balinese people who have been so generous in the way they share their culture and wisdom. I have been invited to attend astonishingly complex mass cremation ceremonies, water temple purifications, marriages, tooth filings, and visits to Balinese healers. Their ceremonies and rituals mark the important transitions in life and offer so many lessons and so much healing. And finally there is the spirit of the place itself. If you ask anyone who has spent a significant amount of time there, they will tell you that Bali can embrace you or spit you out, but that it will always show you the very thing that you need to see. I’ve also felt a strong connection to the textiles of Indonesia. There is a vast range of techniques across the islands, all of which tell their particular cultural story, convey a belief, or recount a history of trade influence. I had the chance to visit the island of Sumba and found an interesting correspondence between my drawings and Sumbanese weavings. I realized that the warp and weft (the vertical and horizontal threads used on a loom) create a structure that is similar to the gridded ledger paper, and I recognized how this limitation (or scaffold) invites a certain kind of form and symbolic language to develop. Even just within the island of Sumba, there is a wide range of ikat (a dyeing technique and weaving style) that are all still made with the same ancestral techniques and natural dyes that have been used for hundreds of years. The ikat patterns are made by tying and dyeing the threads before weaving, and the imagery of these textiles can be nearly psychedelic with a level of figurative detail that seems impossible to achieve. 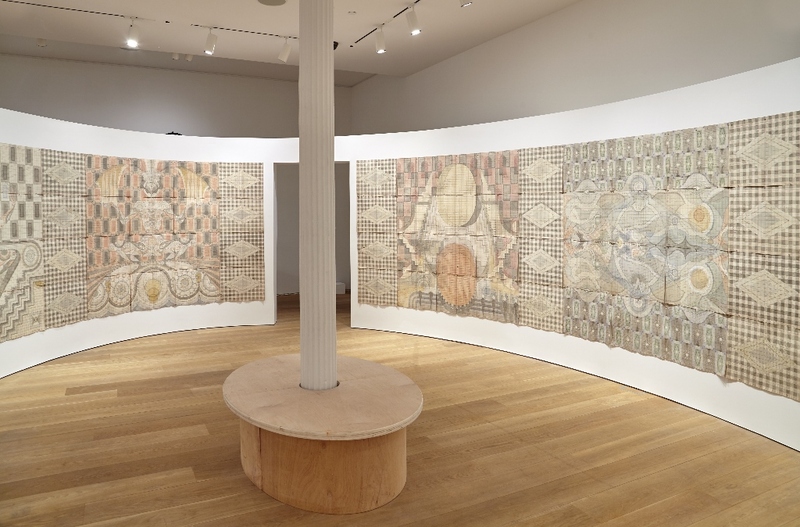 The Sumbanese textiles tell stories about ancestral worship, travels to the afterworld, funeral rites, weddings, and sacrifices all in a language of symbols and geometric forms that move between abstraction and figuration in a way that resonates with my work. Most textiles are made for ceremonial use, which means they mark important moments of transition and transformation, and this is what I was focused on while drawing this body of work. BL: There are many references to Indian, Tibetan, and Theosophical traditions in these new works. How has your reading and study of the art from these traditions affected your thoughts about the subtle, or energy, body? Those references and inspirations have been there since I began drawing nearly ten years ago, but in this show the work has taken on a much more pointed focus. It all began in 2007 when, after discovering the work of Emma Kunz, I traveled to Würenlos in Switzerland to visit her home and view her drawings. I had recently graduated from college and felt this need to see her work in person. When I stood in the space surrounded by her drawings, I felt a sensation of finally seeing the images I had been waiting to see all my life. It felt like receiving a remedy, and this was the true beginning of my interest in drawing the subtle body, energy patterns, and vibrations. I felt deeply connected to Kunz’s language, and viewing her work was a reminder of the very serious power of art to change you. On that trip I also hitchhiked to Rudolf Steiner’s Goetheanum, which piqued my interest in Anthroposophy and then Theosophy and the Thought-Form drawings of Annie Besant and C. W. Leadbeater. In 2009 I lived in India for nine months on a Fulbright scholarship and also traveled in the region. During that time, I had the chance to visit many temples, but the Ajanta and Ellora caves, the Jain temple in Ranakpur, and the Buddhist monasteries in Nepal left a particularly strong impression. My experience of these sacred spaces connected me to the same element that I felt while visiting Emma Kunz’s home, which was an ability to be transported in time and space. I experienced a feeling of respite through this connection with something eternal, a deep, deep silence, and a sense of awe at the devotion that could create such impossible beauty. Louise Despont, Energy Scaffolds and Information Architecture (Oval Room), 2015. Exhibition installation photography by Martin Parsekian. In 2014, I was invited by a friend and collector to attend a symposium on the work of Hilma af Klint at the Louisiana Museum in Denmark. The exuberance of her suite of large works gave me this tremendous energy and started to make me think seriously about the possibilities of pushing scale in my work. That same summer, I saw an exhibit at the Rubin Museum called Bodies in Balance. I was interested in the Tibetan Buddhist illustrated medical texts that blend medical and spiritual sciences. I was intrigued by the mappings of birth, illness, and death and how these internal processes were visualized before modern science and medicine, when there was still space for energy and spirits, winds and demons. There is something about the way visual language is used to categorize, classify, and map these unseen processes that felt like fertile ground. What better way to access these spaces than to visualize them? It was just around this time that the possibility of creating a site-specific installation at The Drawing Center came up. The chain of connections from artists, to temples, to mandalas and thangkas, and illustrated medical texts (to name only a few links) is a thread I have been following for many years. All of these artists and traditions visualize energy and represent complex spaces that exist between mind and body and between humans and the divine. What was most profound for me in The Drawing Center commission was the experience of really entering the space of the work and being enveloped in an explicit architecture. I wanted to attempt to make a space of my own that would offer a connection to these spaces of silence and contemplation. The full text of Brett Littman’s Interview with Louise Despont can be read in the exhibition catalog, available here.